On Friday (24th August) a very special football match to raise funds for the Sir Bobby Robson Foundation will be taking place at Gateshead Stadium. The two teams of sponsored players will kick off at 6pm but won’t hear the final whistle until 6pm the next day – a full 24 hours of football later. 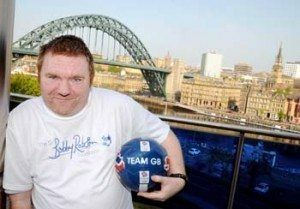 Ian Carr from Gateshead is organising the marathon match, with help from Peter Hughes, and hopes it will be as fun for everyone involved as it will be challenging. Ian says: “We currently have 35 players and will be rotating the teams throughout the 24 hours. “Everyone will play between 12 and 15 hours of football so we know it’s going to be extremely demanding physically and mentally, especially in the early hours of the morning and on Saturday afternoon. The two teams are made up of players from Ashington, Morpeth, Tyneside and County Durham. In addition, two soldiers are travelling from Hull to take part having obtained special leave ahead of their overseas postings. Each player has been sponsored a minimum of £100 for the Sir Bobby Robson Foundation and Sunderland fan Dale Robinson, from Seaham, has raised a massive £1,050. Ian adds: “This 24 hour match will be a completely new experience and something we’re all really looking forward to. We’ve had a lot of help from the staff at Gateshead Stadium and our sponsors 4A Windscreens and Lifetime Flooring. “We’ve also had fantastic support from our match officials who are all volunteers. They include six referees who will be officiating for two hours at a time. For the last four years, along with colleague Neil Eddy, Ian has organised the successful Sir Bobby Robson Foundation Robson 5s five-a-side tournament, which is played each summer at Soccerworld on the West Road, Newcastle. Anyone interested in taking part in the 24-hour match should contact Ian Carr on 0790 3400 581. Sir Bobby and Lady Elsie launched the Sir Bobby Robson Foundation in 2008 and it has gone on to raise over £4 million to help find more effective treatments for cancer. It funds projects within the Newcastle upon Tyne Hospitals NHS Foundation Trust that directly benefit cancer patients from across the north east and Cumbria, and which contribute significantly to research into the disease.